Hi Everyone. Today is a day a day of victory, and I'm so excited be able to share this news with you! IBL Master has just made it through QC to Final Review! 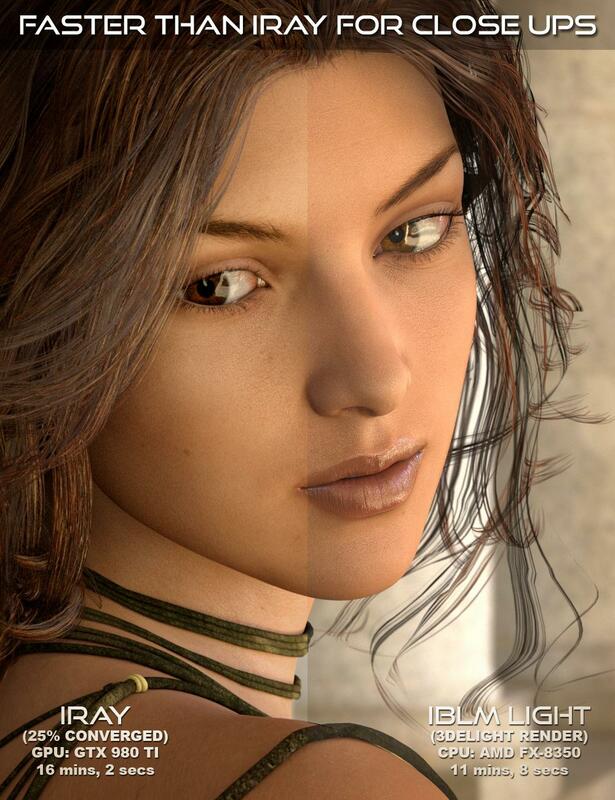 I think it will be a real game changer for Image Based Light in Daz Studio. I have so much to tell and explain, but I know not everyone has time to read a dissertation. So for those of you in a hurry, I have the bullet point features below and I also recommend you look at the pics. 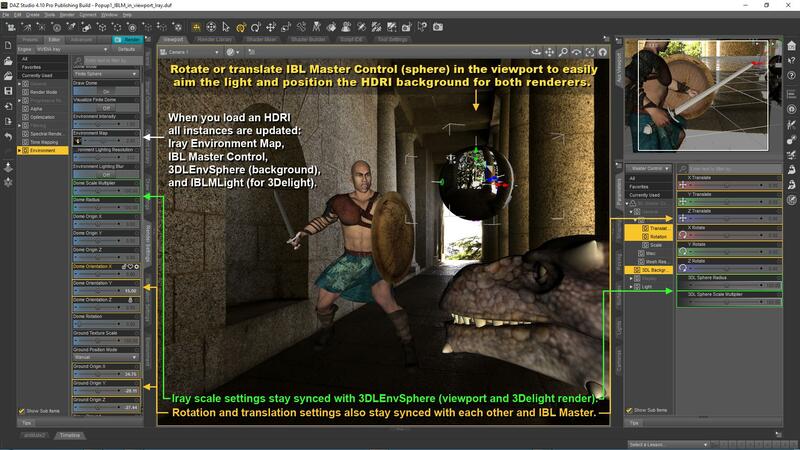 IBL Master is a lighting control that loads as a figure in the viewport and hooks directly up to the Iray Environment Dome in Render Settings, making it easy for you to preview your HDRI in the 3D viewport in realtime (as a sphere) and orient the Iray Dome in scene just as you would any object. It also serves up a new breakthrough IBL shader for 3delight that makes renders not only more realistic but faster than ever before. Building from there, IBL Master debuts bidirectional links between the Iray Dome, the control in the viewport, the new 3delight IBL, and a new HDRI background sphere for the 3delight side. This means that you can change HDRIs and transforms in one place and they all stay synchronized. Every part of this product was designed with synchronization in mind. This means that for the first time, you can pick and choose what you like about both render engines and composite them together without having to fudge the lighting. Now all that might sound complicated, but for the user it's not. It's dead easy to use! If you know how to load a product, apply a preset, and rotate an object, then you already know how to get great lighting with IBL Master. If you are new to any of that, I've provided step by step instructions. Oh, and when I say preset, I mean that any presets you have that load an HDRI onto the Iray Environment Dome now instantly work for 3delight because of bidirectional remote control. So IBL Master doubles the value of those products as well. And if you open a scene that has an HDRI assigned in Iray, IBL Master will pick that up when it loads. 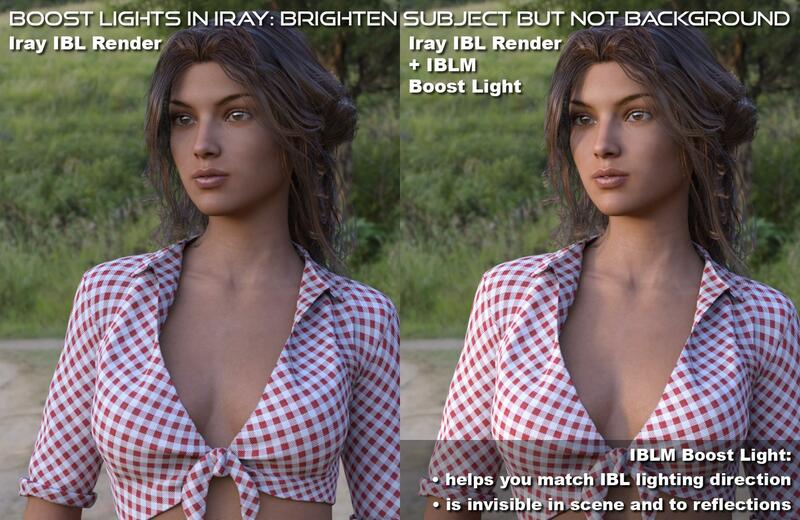 With IBL Master, Image Based Lighting is now seamless between Iray and 3delight because light angle, light quality, and background orientation are now consistent across both engines. 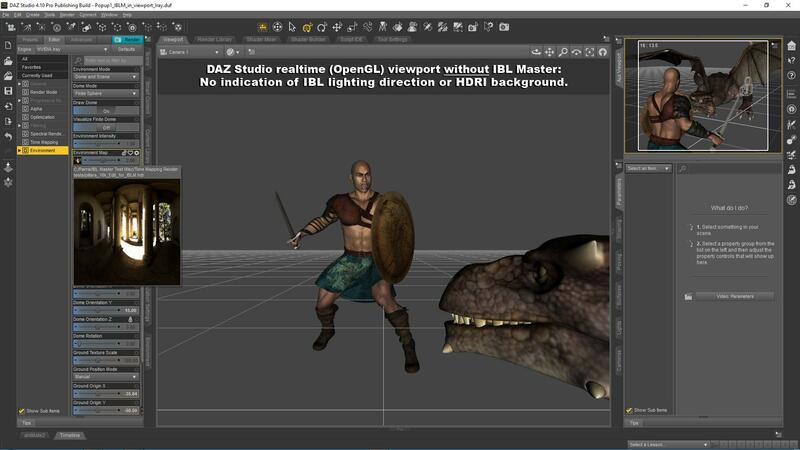 The IBLM Light is the very first to properly convert coordinate space differences between 3Delight and Daz Studio. And unlike Uber Environment 2, this light is a full fledged IBL with specular as well as diffuse, ray traced reflections, and ray traced shadows. So you don't need to add other lights that might diminish the realism of your lighting. That said, there are times when you mays still wish to add more lights, so take a look at the next feature. Ever wanted to adjust the brightness of your subject separately from the HDRI background? I've addressed that issue as well. The IBL Master Control has six ghost lights rigged to targets on the preview sphere, making it easy for you to match up lighting angles to hotspots (like the sun or other lights) on your HDRI. I call these Boost Lights because you can use them to boost the light on your subject, and no one will ever know that you had another light in the scene. Additionally, on the 3Delight side, you can adjust the brightness of the background in Surface settings or turn off image syncing and use a different HDRI for the light and background. To further match function between Iray and 3Delight, IBL Master also has a ground plane for 3Delight with a shadow catcher - the first ever on the 3Delight side to catch ray traced shadows from the IBL. As if that were not enough, with IBL Master rendering with Image Based Light in 3Delight is significantly faster than ever before. For the better part of a decade the popular opinion has been that 3Delight slows to a crawl when IBL and transmaps share the same scene. But as it turns out, it's a glitch in our surface shaders, not the render engine. The IBLM Light shader bypasses this glitch. So, if you have been wanting to get more realism and speed, but have not been ready to shell out thousands for a high end Nvidea system, this product may be the next best thing. 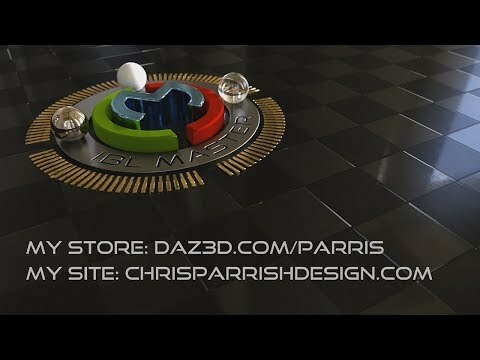 Take a look at the comparison renders I've done and see what you think. 1). 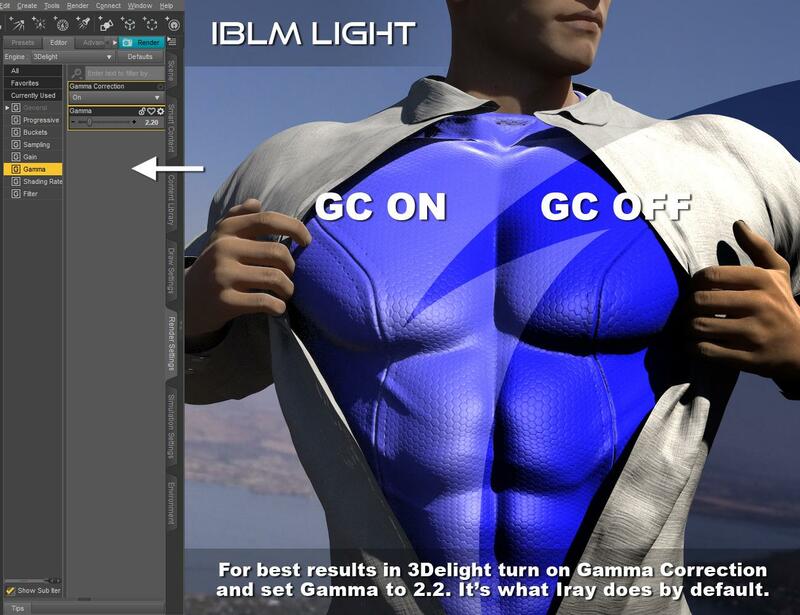 Iray has gamma correction on by default, so you just need to turn it on for 3delight (Render Settings tab > Gamma > Gamma Correction > On and set Gamma to 2.20). 2). 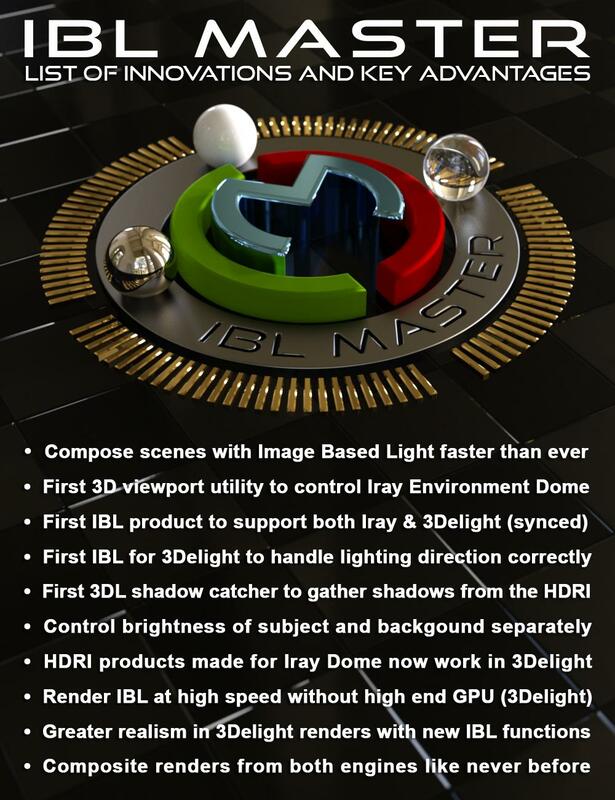 Get IBL Master and you now have global illumination via IBL that equals that of Iray. 3). Cross your fingers about physically based surfaces. I know what I'll be working on next if all goes well. But as my renders demonstrate, number one + number two will get you darn good results! Are your creative juices flowing yet? Is the mathematician in you crunching the numbers in dollars and cents? To me this seems like a no brainer, but of course I'm biased. Let me know what you think! Thanks. Wow this is something I needed about a month ago, looks great ! Looks like a lot of work went into this and looks like a great product, but I have no desire to ever use 3Delight. Is there a benefit to just using this in Iray or is this a geared more tyowards 3Delight product? The promos kinda make it look like it is geared more towards 3Delight users wanting to use IRAY products in 3Delight. Oh wow this is great news , ThankYou Parris for supporting 3DL! And Thank You for posting in the 3Delight thread, I'm all in !!! FSMCDesigns, thanks for the compliment! Yes it was a lot of work! For Iray only users, I feel this is a very strong product if you have any interest in Image Based Light. 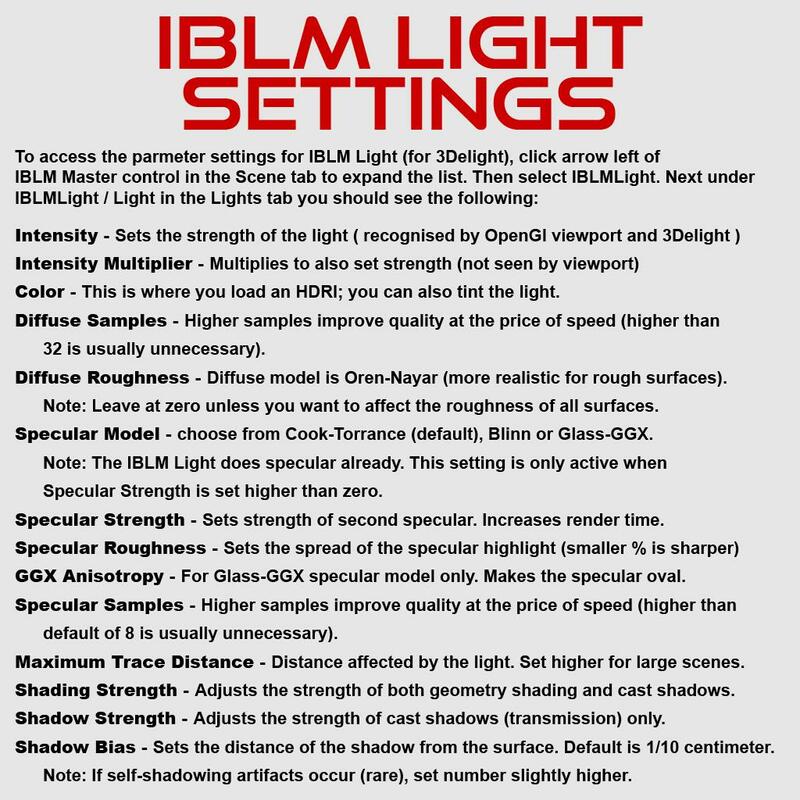 You should, because IBL mimics the beauty and complexity of real world lighting. Fortunately for us there are tons of high quality HDRIs beeing made now worldwide and in our very own store. The only way to simulate this with regular lights would require that you set up a vast array of say two hundred lights or so. Who has time for that? The most common problems that many users, my self included, have faced on the Iray side are that there is nothing in the viewport to show you which way the light is pointing, and that you can't control the brightness of the background separate of your subject. The latter often happens because the dynamic range of a given HDRI may over light or under light from hotspots. Not all HDRIs are perfect. So I've addressed these issues specifically for Iray users. And it will pay for itself right quick if you spend any kind of time wrestling with these issues. Thanks, Pete! And thank you all for your encouragement. You have no idea how much it means to me! IBL Master has been the greatest challenge I've ever faced as a PA. Many of the things I've had to learn to make this all work do not exist in a manual, a course, or anywhere on the internet. So the road to the marketplace for this has been perilous. But we are almost there!!! The most common problems that many users, my self included, have faced on the Iray side are that there is nothing in the viewport to show you which way the light is pointing, and that you can't control the brightness of the background separate of your subject. This product just adds lights though, right? That's not controlling the background brightness separately from the light it casts, it's adding a new light which people already do. I was hoping this would let me genuinely control the dome brightness without making two passes. I'm sorry, this looks great for 3Delight but I see no actual improvements for Iray. Sorry, I wish it were easier to help you see the difference. But I have a video coming very soon that should make it all clear. Matching the light/shadow direction with traditonal lights is very difficult without my light rig because while you can aim the light at the subject by looking through the light camera, you can't accurately determine if the light is positioned so that it is in a direct path between the HDRI light source and the subject. That matters, and it will show itself as shadows being misaligned, like you have two suns or whatever. With the Boost Light rig, you just rotate the target on the sphere so that it centers on the hotspot. Yes you can preview the light with the Light Probe Tool, but rotating it will not rotate the Iray Environment, so you have to copy/paste/do math. My preview is hooked up to the Iray Dome, so when you rotate, translate, or scale it, you are controling the Iray Dome as well. Control is easy peasy. And if you want to see what is behind you with the Light Probe Tool's chrome sphere, you can't do it in realtime (OpenGL). You have to do a render, or you need a high end card setup to get interactive mode without lag. Looks really useful. I'd be really interested in knowing if this could be used to render different parts of the same scene with both engines so that, an rendered set of figures could be placed amidst scenerey generated with one of themore complex 3DL shaders like Age of Armor's Grass and Rock? Now you are getting it!!! ** That is precisely what you can do in post work ( just simple layers in Photoshop or another layered image editor). Rendering different parts in either engine has been possible since the beginning. But now you can get the lighting the same, so the marriage will be believable (seamless even). **Sorry not trying to imply that you ever didn't get it. I'm actually just really glad that you asked that question. Yes, you are so right. Steep is not a big enough word. As absurd as this sounds, I actually understand some aspects of the problems and remedies surrounding this better than the lead programmers at 3delight and Daz. They are geniuses who program for a living. They're very generous with their time but always busy, with their priorities set by higher-ups. Meanwhile, I have been a dog with a bone on this thing for about a year. Particularly, with the problem with coordinate space not being converted properly, which has actually plagued every IBL for DS and 3DL since the beginning, it could very easily have been a crash and burn (never to be solved). ***EDIT*** Ok I need to make an edit here because in re-reading, I can see that I messed up big time! Guess I was having a bad day, but this forum is not the place for a rant. So I want to apologize to all here who might have read the paragraph above and got a different impression then how I really feel about the programmers at 3Delight and DAZ. If what I said above suggests I think I know more about the function of 3delight and Daz Studio than their programmers, that's just flat out absurd. And saying the coordinate space issue was "never to be solved" is presumptuous. I'm sorry. One thing I was trying to say, but probably failed at was that these individuals are very giving of their FREE time, which is absolutely something they aren't obligated to do. During the course of this project I got help from folks "off the clock" that was absolutely critical to getting this thing to function properly. I'm not special, I was just lucky. The process I went through was stressful, and after a year at it, I'm tired and probably a little grumpy. But at the end of the day, I'm eternally grateful to everyone who helped me get this done. Please forgive me for not using better judgment and for not being more clear. For those of you who are not familiar with the coordinate space issue, in simple terms it means you could never rotate the light in DS and get the correct lighting angle rendered in 3delight, because 3delight would think you were rotating a different axis in a different direction, etc. This was difficult to diagnose because some HDRIs appeared to work just fine, often because the axis location of the hotspot (sun) was somewhat interchangeable. What was once ambiguous is no longer the case because of the great HDRIs that exist today, and with my preview and Iray showing us the correct lighting angle. So I figured not getting this to work would be a deal breaker. When I have to do this I just parent to a sphere with a mark and rotate. Looks like it might be useful to speed workflow up for some people though. Do you have a way to easily match effective light size as well as rotation? Because that would be REALLY useful. When I have to do this I just parent to a sphere with a mark and rotate. Sorry, I'm not following. You parent what to what? Do you have a way to easily match effective light size as well as rotation? Because that would be REALLY useful. Hmmm...I don't see a scientific way to calculate the size of the mesh light based on the size of the hot spot. But since it is a ghost light, it doesn't seem to be an issue. You can, however scale my Boost Lights to your needs fairly easily. Parent the light I want to use to match the IBL to a sphere that has a mark on it, everything at ground level. Then the light lines up with the mark, and I can rotate that sphere until the mark lines up with the IBL hotspot. Works for me, anyway. I'm very interested to see what you are doing now (it just occurred to me I could do this way better with two nulls instead of a sphere). Hmmm...I don't see a scientific way to calculate the size of the mesh light based on the size of the hot spot. But since it is a ghost light, it doesn't seem to be an issue. You can, however scale a mesh light to your needs fairly easily. I think I could cheat pretty close with cone primitives, but it would be a pain, so I was hoping. Size of the light isn't related to whether you can see it, it's to match up the specular and shadow softness to the IBL. Probably would only take a couple test renders to hit the sweet spot with scaling, though, and for sun lighting this isn't so much a concern. Ah, got you now. Your methods are very well thought out. I thought you were refering to controling the Iray Dome (light and background) by rotating a primitive, which is only currently possible with IBL Master. Yes, unfortunately I am very bad at scripting for DS so I have nothing like that. I wish you best of luck with your product, especially for supporting 3Delight which hasn't had any new tools for a long while. Possible to combine this product with for example Marshian's RR3 or the AoA lights? Works in progressive mode as well as normal? Would love to know your settings for these promos! The reason I ask is you can see a tiny bit of grain on those pics if you look closely, so just wondering about shading rates and the such. You're asking all the right questions, and its helping to get all the facts covered. Thank you. Though I haven't tested with them specifically yet, I see no reason why they shouldn't play nice together. I should add that using IBLM Light with no map will give you omnidirectional ambient like Age of Armour's Advanced Ambient Light (no flagging though). Yes, in fact "Progressive Rendering > On" in 3Delight Render Settings will eliminate the grain you observe. Another way is to bump up Diffuse Samples. I rendered all promos with the default settings (+ Gamma Correction on and Gamma set to 2.2) except for bumping up the Intensity when I felt it was necessary. Some HDRIs are darker that others. Below is a screenshot of available light settings, the detail information about those settings, and another comparison: 16 Diffuse Samples (default) Vs 32 Diffuse Samples Vs Progressive and their times. In these tests the speed hit was nominal and I particularly like that the default does not produce the large blocky noise that UE2 demonstrates with low samples. This will be great for users of 3Delight, curing many problems. 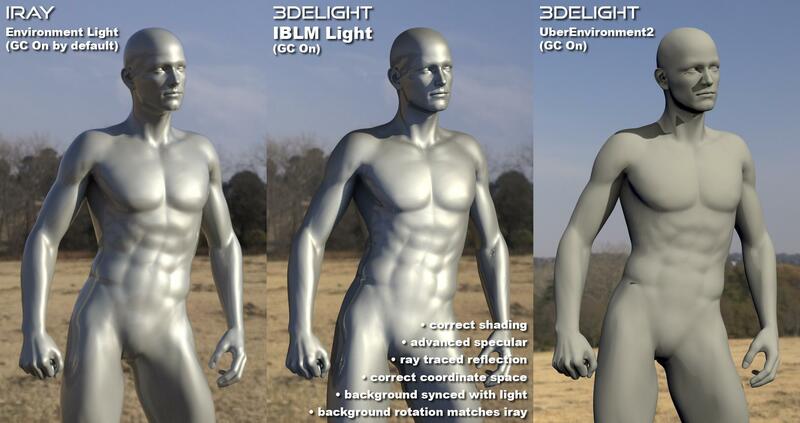 The ability to get compatible light between 3Delight and Iray will help. You can use compositing then to cover noisy areas. And this will be great for animators with the time savings and the abilities 3Delight has like motion blur and better displacement! Yeah I can't wipe that silly smile out of my face:o And it seems you don't have to worry about rendering transmapped hair either, that's HUGE! This product sounds extremely helpful. I use Iray exclusively and struggle with lighting on a daily basis. I'm wondering whether the product will give a boost to interior scenes lit through windows with HDRIs? Thanks! Yes. The rigged Boost Lights allow you add more light while making it easier to get the angle of the light to match the HDRI.